When I lived in Chicago and flew out of O’Hare it seemed like the United Credit Card was heavily advertised in the airport and in the seat back pockets of every flight. I don’t know how I ended up with it, but I’ve see many AD members with it because they never looked for another card since getting this one. The card does earn Mileage Plus Miles on United which can be used to book on many Star Alliance flight from Okinawa such as ANA and EVA Air. 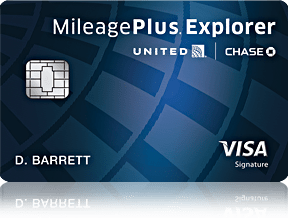 The card replaced the United Mileage Plus card from Chase, it now offers 2 lounges passes annually as well as a free bag to check (which military get anyways). The only bonus Mileage is that you get 2x Miles on United Airline ticket charges another plus is no foreign transaction fees. Overall this is pretty weak as compared to 3x points on Amex Business Gold or which can be used to book on United via ANA another Star Alliance Partner. Better yet you can earn 2x Ultimate reward points on Chase Sapphire Preferred Card and use those for United. The only reason I have this card is that on its anniversary I alway negotiate for more miles by suggesting that I have no need for both the Sapphire Preferred and the united card. Usually I get the offer for $150 or 15,000 miles. Go for the miles! So for the $95 annual fee the card is not at all worth it. You could spend that on a Chase Sapphire card which is the same price. However it doesn’t matter for Military Members because today I just got my SCRA annual fee waiver!!! 4) Select Apply for SCRA under the military section as shown above. 5) Wait forever for a response. If you get denied just try again next year and negotiate you way to a statement credit worth more than the annual fee, they key word is asking for the retention department. Or just use this link for the Chase Sapphire.